Imagine driving along, minding your own business and then seeing this on the highway. 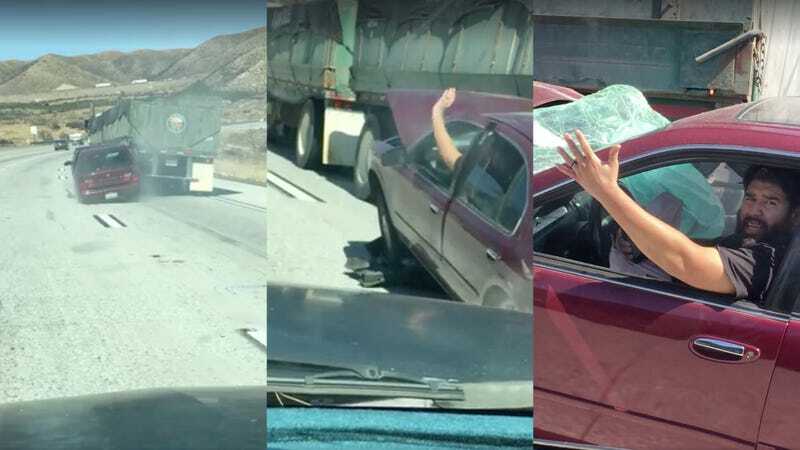 A cell phone video, taken yesterday by a driver named Brian Steimke, shows a maroon Nissan Maxima being dragged along behind a truck. When Steimke pulled up alongside the car, he discovered the Nissan’s driver still in the driver’s seat, waving frantically for someone to stop the truck. Steimke’s video caption said that the two had been driving in this manner for four miles. After the truck pulled over, Steimke could be seen approaching the truck driver, demanding why he kept driving when there was clearly a car stuck to his truck. “I didn’t know it,” was the truck driver’s response.